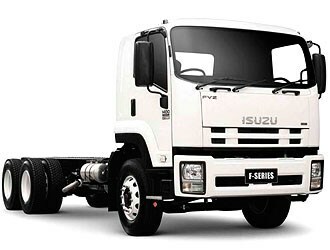 Isuzu has sought to avoid the need for local engineering modifications in its new FVY1400 agitator. Its ready chassis means that the FVY 6x4 is now available with the appropriate wheel base and driveline for agitator work. The 6x4 FVY1400 still relies on the same 7.8 litre Euro 5 (ADR80/03) 221kW Sitec engine found across the FVY range but will also be fitted with a 3500 series Allison automatic transmission and a Powauto 'live drive' power take-off unit. The chassis rests on Hendrickson airbag suspension and uses Dana drive shafts and Meritor axles front and rear. The agitator has also been fitted with aluminium wheels to further reduce tare weight. We recently test-drove the FVY1400 agitator fitted with a 6.5 cubic metre Cesco bowl and loaded to a gross weight of 19 tonnes. Keep an eye out for our upcoming feature and video on the drive.